Two immunotherapeutic agents are approved for the treatment of advanced or metastatic renal cell carcinoma. 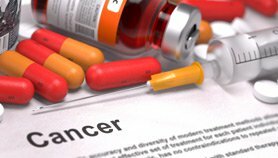 In 2009, bevacizumab received FDA approval as a part of combination therapy for the treatment of metastatic renal cell carcinoma. Nivolumab was approved in 2015 to treat advanced or metastatic renal cell carcinoma in patients who have already been treated with an angiogenesis inhibitor. Nivolumab and bevacizumab are recommended for the treatment of patients who have progressed following first-line therapy; nivolumab, again, is recommended for those who have previously been treated with an angiogenesis inhibitor. A nanoparticle-drug conjugate called CRLX101 (Cerulean Pharma) was fast-tracked in early 2015 for the treatment of metastatic renal cell carcinoma. 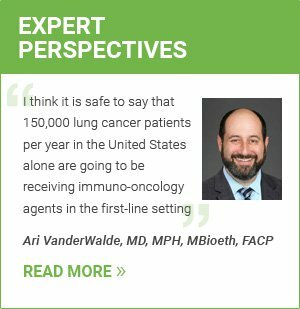 Several phase 2 and phase 3 trials are underway to investigate the use of combination immunotherapy with existing agents, including nivolumab with ipilimumab, atezolizumab with bevacizumab, and atezolizumab with varlilumab (Celldex Therapeutics), an investigative anti-CD27 monoclonal antibody. A dendritic cell vaccine called AGS-003 (Argos Therapeutics) is in phase 3 testing, as well.